This page contains information about safeguarding plans for the storage of explosives on works sites. Explosives sites are legally required, under the Explosives Regulations 2014, to submit a safeguarding plan to the relevant licensing authority and the local planning authority within 28 days of a licence being granted, or varied in a way which affects the separation distances. Once a licence is granted, a safeguarding plan can be created taking into account the necessary separation distances specified in the licence. The purpose of these distances is to limit risks to people within the vicinity of the licensed site. When can I prepare my plan? Licensees are strongly advised to prepare a safeguarding plan as soon as the draft licence has been agreed, and submit it to ensure legislative requirements are met. Your plan must show the explosives site and the surrounding area. It should be marked with colour-coded lines to show the protected works or safeguarding distances. 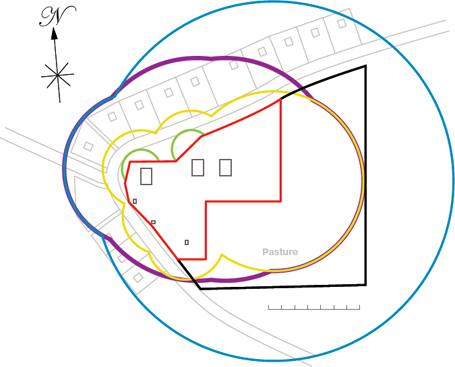 The scale chosen for a plan depends on the size of the site and the extent of the purple or blue line. The scale chosen should be such that the finished plan is no larger than A0. 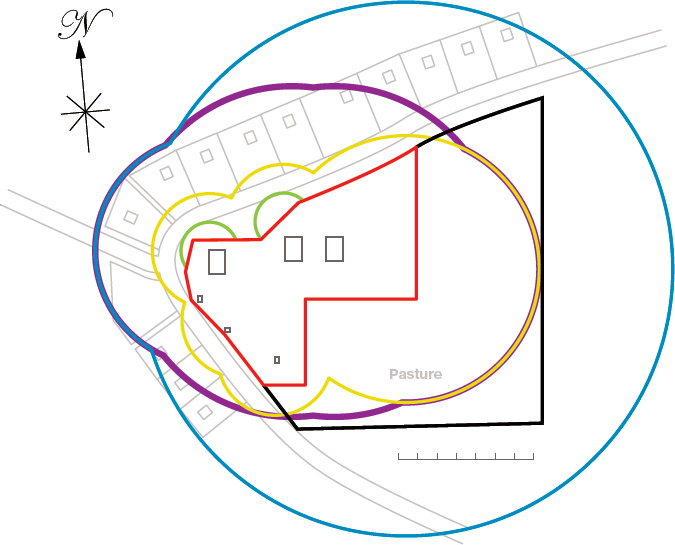 It may be better to produce two plans for larger sites; one showing all but the purple line and the other showing only the red and purple lines. Safeguarding plans should be based on the most recent ordnance survey. Ordnance survey plans that are well suited for this function include 1:2500 Superplan and 1:5000 Landplan. Significant recent developments should be marked on the plan. Once agreed with HSE, one copy of the plan should be sent to the local planning authority, one should be sent to the licensing authority (HSE contact details are below) and one should be kept at the licensed site for reference. There are two manufacturing buildings (P1 and P2), four magazines (M1 to M4) and two office buildings. An adjacent field is owned by the site, but let out to a local farmer. For the purposes of safeguarding plans, land occupied on a lease is regarded as being owned. Figure 1 demonstrates how a plan for this licence would look. The red and black lines indicate the extent of the licensed site and extent of ownership. The black line need not be shown where it is with the same as the red line. Lines and arcs are drawn from the edges of each building at a scale distance corresponding to the appropriate Class B distance. Once this has been completed for each building, the outermost envelope of the arcs and lines is coloured green to indicate the maximum extent of the Class B distance where it extends beyond the black line. The procedure is repeated for the yellow line using the Class D distance and the purple line using the Class E distance. For those buildings using a reduced Class D dwelling distance, the reference zone radius for the buildings also needs to be shown. The plan is then marked with its scale and an indication of which direction is north (if a plan is to be photocopied, it is important that a scale bar is added before photocopying). The plan is then named, dated and despatched.